The highly anticipated Mercedes-AMG A35 4Matic has been priced from £35,580 ahead of its launch early next year. 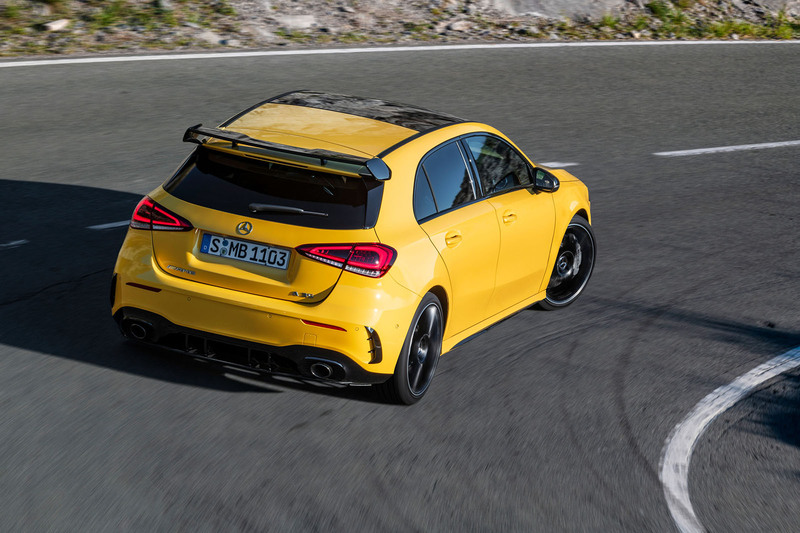 The new hot hatch features a uniquely tuned turbocharged 2.0-litre engine delivering 302bhp as well as a seven-speed dual-clutch gearbox, on-demand four-wheel drive and a specially stiffened body. It is available to order now, with the first deliveries due in spring 2019. 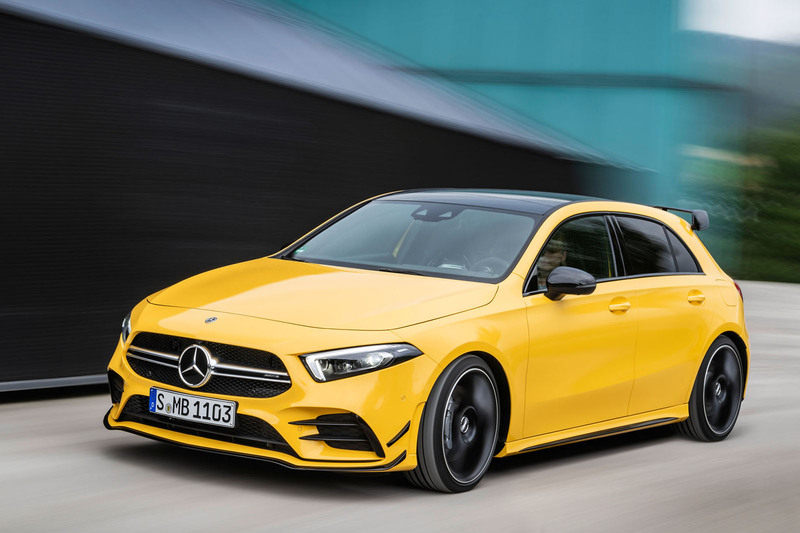 The new AMG model, revealed at the recent Paris motor show, is positioned between the latest A250 and upcoming second-generation A45 4Matic in the German car maker’s performance car line-up as a rival to the BMW M140i and Audi S3 as well as a raft of other hot hatchbacks, including the Volkswagen Golf R, which costs from £34,910 in the five-door bodystyle with the automatic transmission. Conceived to offer greater performance potential than the front-wheel-drive A250 but at a price that sees it pitched some £6000 below that of the £41,230 previous A45 4Matic in the UK, the A35 4Matic is being launched after strong sales of the A45 4Matic and other four-cylinder AMG models, including the CLA45 4Matic, CLA45 Shooting Brake 4Matic and GLA45 4Matic. "The demand for our compact models has developed in recent years. This success has encouraged us to further expand our portfolio and place it on a broader footing," said Tobias Moers, CEO of Mercedes-AMG. At the heart of the A35 4Matic is a revised version of Mercedes-Benz’s M260 engine, as used by the A250. 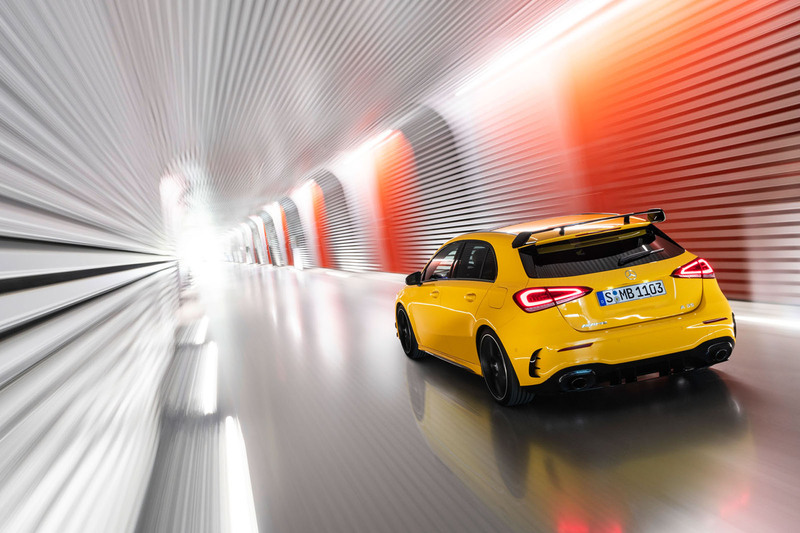 It is described by AMG as a new development, although the new four-cylinder unit shares its 83.0mm bore and 92.0mm stroke measurements and design of its die-cast aluminium crankcase with the M133 engine of the A45 4Matic. Key engineering attributes of the AMG-tweaked powerplant include uniquely tuned twin-scroll turbochargers with reduced back pressure, reprogrammed Camtronic variable valve control, special liners that contribute to conically shaped cylinders and a bespoke exhaust system with an automatically controlled flap that modulates the exhaust note depending on the driving mode. With 302bhp at 5800rpm and 295lb ft of torque between 3000rpm and 4000rpm, the transversely mounted engine delivers 81bhp and 77lb ft, more than the less heavily tuned version of the M260 unit used by the A250 but 74bhp and 55lb ft less than the more highly strung M133 engine used by the A45 4Matic. Of the keener, premium-brand competition, the rear-wheel-drive M140i’s turbocharged 3.0-litre inline six-cylinder engine delivers 335bhp and 369lb ft and the four-wheel-drive Audi S3’s turbocharged 2.0-litre four-cylinder offers up 306bhp and 280lb ft.
Drive is channelled to all four wheels through a seven-speed dual-clutch gearbox featuring AMG’s own Speedshift software that is claimed to provide more rapid shift times and more intuitive upshift and downshift characteristics than the standard software package, as used by the A250. As well as offering both manual and automatic modes, the in-house-produced gearbox also includes a Race Start function for improved off-the-line accelerative performance as well as steering-wheel-mounted paddles as standard. Allied to the A35’s gearbox is a heavily revised version of the 4Matic four-wheel-drive system used by the first-generation A45. It boasts variable distribution of drive, from front-wheel drive only to a 50:50 apportioning to the front and rear axles, via an electro-mechanically operated multi-plate clutch integrated into the rear axle assembly. The driver is able to choose between five different driving modes via an AMG Dynamic Select controller: Slippery, Comfort, Sport, Sport+ and Individual. The Slippery mode, a new development that is also planned to appear on the new A45 when it is launched in 2019, is programmed for wet road conditions, with reduced power and torque and earlier upshifts in automatic mode. Also new is a so-called 'gliding' function. It allows the driver to choose between 'reduced' and 'moderate' settings for differing engine braking characteristics while coasting on a trailing throttle within the Individual driving mode. With the Sport+ mode and Race Start function engaged, the A35 4Matic is claimed to accelerate from zero to 62mph in 4.7sec and reach a top speed limited to 155mph. Combined cycle consumption is put at 38.7mpg, equating to average CO2 emissions of 167g/km on the recently superseded NEDC (New European Driving Cycle). This gives the A35 4Matic a slight edge over the M140i and S3, which are claimed to accelerate to 62mph in 4.8sec and 5.3sec respectively, in outright straight-line performance. 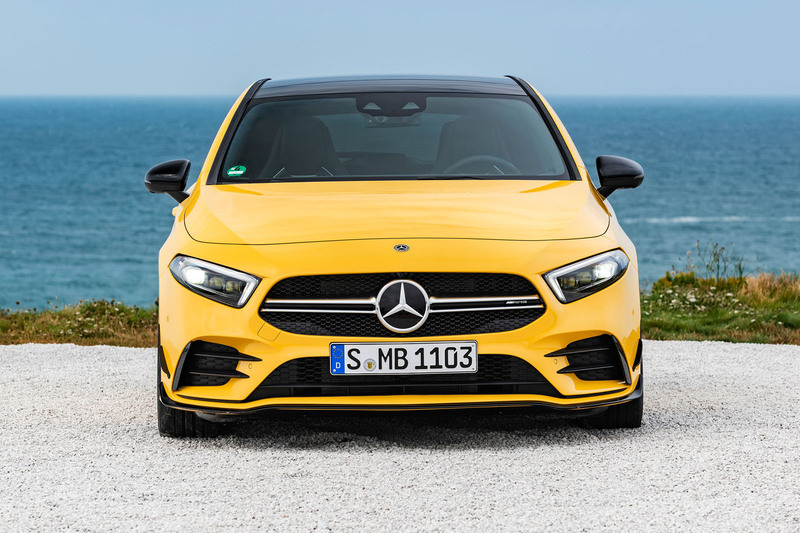 To cope with the added performance potential brought on the A35 4Matic’s new drivetrain, Mercedes-AMG has stiffened the bodyshell of the A-Class hatchback on which it is based with the addition of a so-called 'shear panel' underneath the engine. The aluminium structure is bolted to the existing steel body shell and, in combination with two additional diagonal braces, is claimed to provide added torsional stiffness to the front end. The stiffened body structure supports a MacPherson strut front suspension. 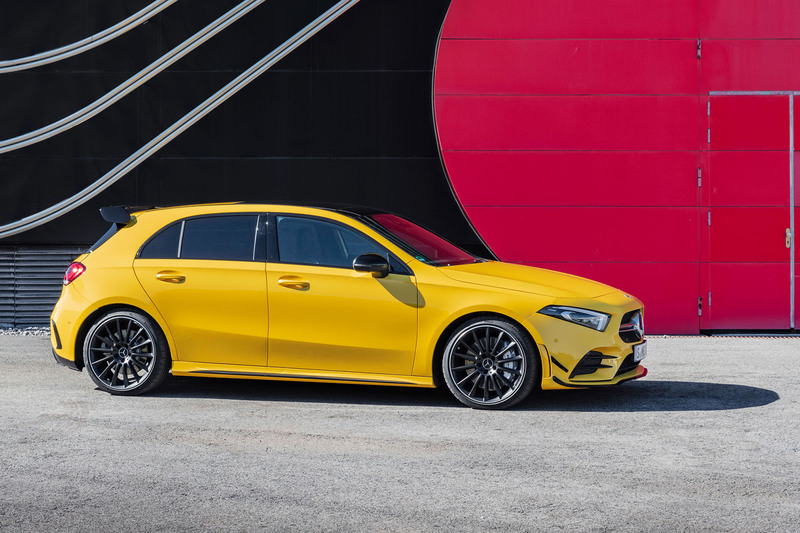 It uses a newly developed aluminium carrier and radially bolted steering knuckle that AMG claims reduces the unsprung masses and provides more sensitive response to the system used by the A45 4Matic. The rear suspension is based around the four-link system used by upper range A-Class models, with three transverse arms and the trailing arm, the wheel carrier and bearings shared with those of the A45 4Matic. Passive dampers are standard, though buyers can option the new entry-level AMG model with an adaptive damping system that provides three different levels of stiffness. The electro-mechanical steering uses variable assistance and a more rigid mounting than the system used by other new A-Class models. The brakes, meanwhile, use four-piston monoblock calipers and 350mm vented and perforated discs up front and single piston calipers and 330mm discs at the rear. The A35 4Matic builds on the sharpened appearance of the fourth-generation A-Class with a unique grille, more heavily structured front bumper, standard 18in alloy wheels, wider sills, bold tailgate-mounted spoiler and a new rear bumper featuring a prominent diffuser element bookmarked each side by blackened round tailpipes. Inside, the standard A-Class interior has been reworked with unique upholstery for the seats an AMG steering wheel with touch-pad controls and AMG-specific graphics for the digital instruments, including a Supersport mode with a large central round rev counter. Other new features include AMG Track Pace as part of the MBUX infotainment system. It permanently records data during track driving, enabling the driver to analyse a range of information including acceleration, braking and lap times. A series of options packages are offered on the new car, including the £2595 AMG Style package that adds an aerodynamic bodykit and 19in alloy wheels. Following its appearance on the new fourth-generation A-Class hatchback, the new 35 badge is also planned to grace successor models to the CLA, CLA Shooting Brake, GLA as well as the newly unveiled A-Class Saloon and upcoming GLB compact SUV in a move that will provide a new six-model-strong entry-level range for Mercedes-Benz’s performance sub-brand. Sorry ,that wide screen TV for the dash is distgusting. The perfect description of this sad car. Why does the performance A Class have to look so vulgar? The standard model is relatively staid, if not quite as classy and restained as the C, E and S Class but for some reason Mercedes feels the need to make the AMG versions looks tacky, cheap and just OTT. An S3 or Golf R for example may be considered a bit too restrained but at least they look purposeful without being brash. As for the interior, the current A Class may not have been around for long but everytime I see a photo it just seems to appear fussier and tackier than ever and as such, it's not ageing well. In a year's time this will look like a old and mess interior. As a privately owner road car it's pretty much better in every way to the A45. Nope, not drunk, simply simple, lacking in language skills, spelling, grammar and life skills...only to be expected from a mouldy couch potato, hunched up in a decrepit sofa. TwIT, the w is silent, as you should be. I would take this over the A45 too - its all the power you need (well actually probably too much) but not sure about all the add ons (splitters on bumper etc) - and I am sure the car in the pictures doesn't retail at £35k ish. What this sounds like is a undesteering audi and any other such similar "layed out" vehicles. It's not what I would want for that amount of money however I do feel it is now down to the younger generation to determine what types of vehicle they want to buy. Personally I'd take the RWD option and leave the "0-60/Nurburgring brigade" to their own devices. I do hope the car pictured has an optional 'aero kit' fitted, as I was eyeing one of these up as my next car, but that rear wing puts me right off!